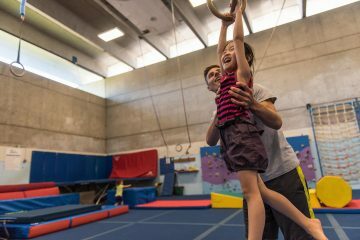 UBC Active Kids does a home learners' gymnastics class on Mondays from 12:30 - 2:00. Designed by request for local families who homeschool their children, children develop physical literacy and basic gymnastics skills in a fun-filled environment. This fun program allows children to develop basic gymnastics skills. Designed specifically for the home learners community! This program offers a variety of exciting games and skill builders across various sports with an emphasis on fun and physical literacy development. Registration and participation take place at the Osborne Centre. UBC Active Kids is a student development and community engagement program designed and run by the School of Kinesiology, offering employment, professional development and volunteer opportunities for the undergraduate, graduate, and alumni of the School of Kinesiology and UBC students in general. The Active Kids program philosophy emphasizes positive sport experience and encourages lifelong participation in physical activity for all ages and ability levels. With certified coaches including Kinesiology students and alumni, we use evidence based practices to create a fun, safe, active, and motivational learning environment. We currently offer Gymnastics classes, Gymnastics Summer Camps, and Gymnastics Drop In times for children and Adults, Soccer classes, Basketball classes, Multisport classes, Birthday Parties, Private Lessons, and Group Rentals and School bookings. All of the programs are run by qualified coaches who love to make movement fun. Registration opened (Nov 14th) for The Winter 2017 Term. From January 9th until the end of March.